This event brings together industry, education, and military resources under one roof. This all day event was created to assist veterans and service members in translating and converting hard won military training and experience into a rewarding civilian career. Sponsored by William Penn University, the April 15th represented: Rockwell Collins, Alliant Energy, Principal Financial Group, Home Depot, Transamerica, and UnityPoint. The Career Summit on April 15th marks the final and full completion milestone and re-launching of the facility. 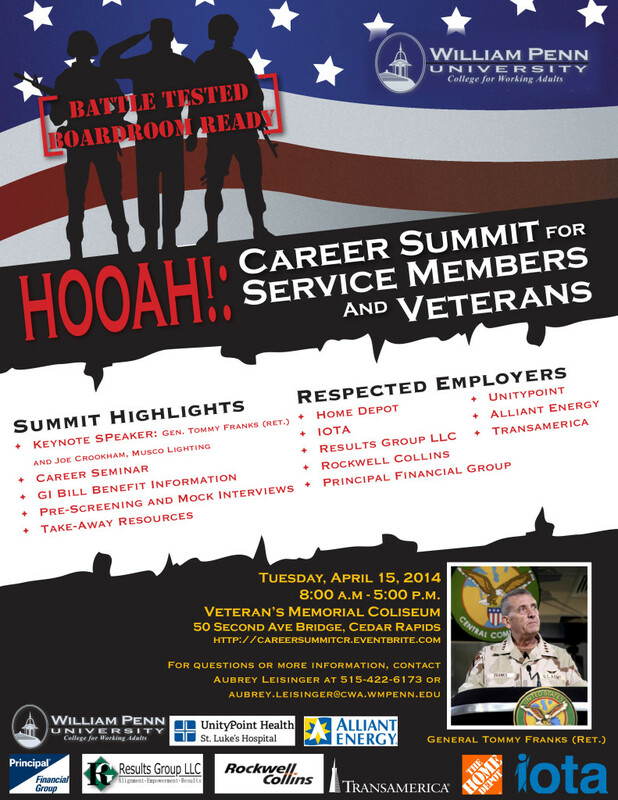 To register for the Veterans and Service Member Career Summit visit this link: http://careersummitcr.eventbrite.com, or contact Aubrey Leisinger at William Penn University. Contact: Teri Van Dorston, Assistant Director, 319-286-5050, T.VanDorston@cedar-rapids.org. – http://www.cedar-rapids.org/government/departments/veterans-memorial/pages/default.aspx. The Veterans Memorial Commission is responsible for the management, development, operations and maintenance of the Veterans Memorial Building, Veterans Memorial Stadium (home to the Cedar Rapids Kernels) and the All Veterans Memorial Park. Contact: John Mikelson, 319-321-1387, midwestmilitaryoutreach@gmail.com. www.midwestmilitaryoutreach.org. Midwest Military Outreach mission is to empower and retain the talent of our Service Members, Veterans and their families as they transition to productive civilian life.